Many may not realize it but the health of your skin is actually directly related to the quality of your sleep. In a number of ways, with everything from acne to wrinkles being caused by poor quality sleep. Here are a few specifics when it comes to the way in which sleep quality affects your skin, as well as a few tips on how you can improve the quality of your sleep each night. It has been believed for years that poor quality sleep is linked to an increased rate of skin aging, but this has now been scientifically proven. The study, which was commissioned by Estee Lauder, is the first of its kind to not only prove that inadequate sleep is correlated with accelerated skin aging, but also that it affects skin health in other ways too. This study focused on women between the ages of 30 and 49, and discovered that the women who did not sleep well at night experienced a much higher rate of skin aging, in the form of fine lines, decreased skin elasticity and uneven pigmentation. Are you wondering what exactly it is that causes these results? It all comes down to the way in which your skin heals and repairs itself while you are sleeping. However, this only really happens if your body falls into the deepest stage of sleep, as this is when your body then produces the most human growth hormones. Why do you need these human growth hormones? Because these are what help to stimulate your skin cells to repair themselves. They are also crucial when it comes to the production of collagen, the protein that keeps your skin smooth and firm. This means that if your body does not fall into the deepest stage of sleep, all of these processes will be drastically slowed down, resulting in your skin aging so much faster. 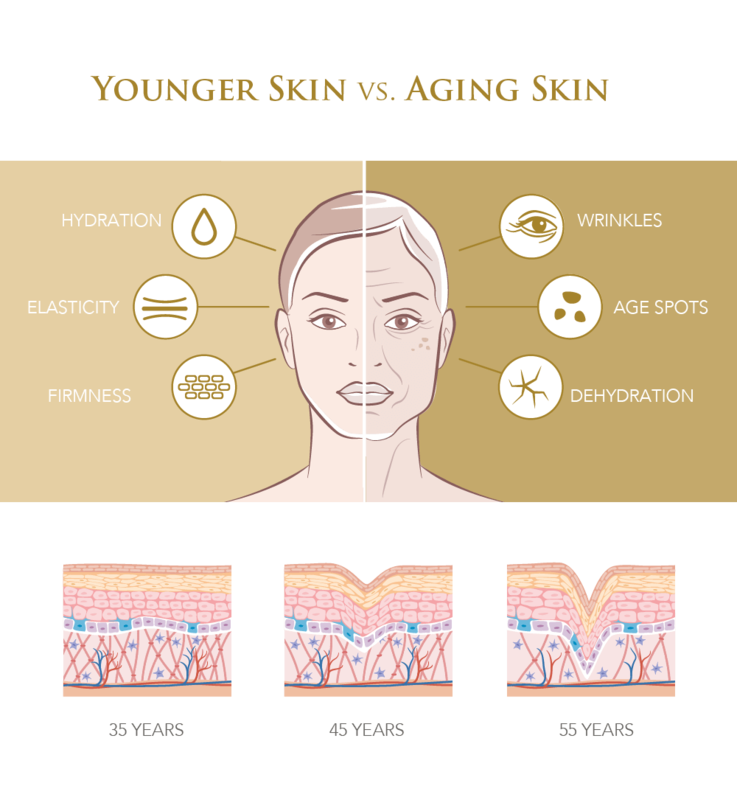 The same study mentioned above not only showed how inadequate sleep and accelerated aging are linked, but it also discovered that a lack of quality sleep caused the skin to be unable to repair itself from environmental stressors. What exactly are environmental stressors? One of the biggest is the sun. In the study, those who experienced good quality sleep recovered much faster from stressors such as sunburn. To be specific, their skin recovered 30% more efficiently than those who had poorer quality sleep. On the other hand, those who had poor quality sleep had a redness to their skin that remained quite high over 72 hours, which is a sign that inflammation is still present. When you do not get enough quality sleep, this ends up putting your body into fight or flight mode each night. This then causes your vital organs, including your brain, to absorb as much oxygen as possible from your blood. This means that the blood that ends up running through your body is much more de-oxygenated than usual, making it darker in color. Since the skin around your eyes is the thinnest area of skin on your body, the darker colored blood shows through, showing up as dark circles around the eyes. Since the rest of your skin will also not be getting enough oxygen, this turns it paler and duller, which only ends up emphasizing the dark circles. Poor sleep quality also increases the levels of inflammation within the body. This causes the blood vessels underneath the eyes to become dilated, which brings them closer to the surface of your skin. The area of your skin that contains these blood vessels will then end up swollen and puffy, while also often taking on a blue or even black tinge. While improving the quality of your sleep is the best way to deal with these problems, an eye cream can also really help. When applying your eye cream, use your ring finger to gently dab the cream around your eyes, patting it in rather than rubbing it in. Since the skin around your eyes absorbs products and ingredients quite quickly, make sure that you do not overload it with cream, as the area here still needs to be able to breathe. As mentioned above, your body produces human growth hormones while you are in the deepest stage of sleep. But what happens if you do not reach this stage? Your body will then begin to release another hormone called cortisol, which is commonly referred to as the stress hormone. Wondering how cortisol affects the skin? There are many skin conditions out there that are triggered by the immune system, such as eczema and psoriasis. Sleep is essential for a healthy immune system, and without quality sleep, your body will not be able to properly regulate its immune system. It means that any immune-related skin conditions will start to worsen and flare-up more. While there are several steps that you can take to boost your body’s immune system, none of these will be able to counter the benefits brought about by quality sleep. Your skin’s natural barrier is crucial when it comes to maintaining your skin’s moisture levels, as this protective barrier prevents moisture from evaporating. Each night when you fall into a deep sleep, your skin’s barrier heals and repairs itself, becoming stronger. A weakened barrier. This not only leads to dry skin, but also to an increase in skin damage. Since your skin’s protective barrier will not be working properly, it will not be able to keep all of the dirt, bacteria and other unwanted substances that come into contact with your skin each day from penetrating into your skin. Of course, a thick moisturizer can help to boost up your skin’s barrier, but this will only be a temporary fix until you have managed to improve your quality of sleep. After reading all of this, you are likely now convinced that you really do need quality sleep in order for your skin to thrive. However, how do you know whether or not you are actually getting quality sleep? Your only option to accurately measure this would have been to visit a specialist sleep center and undergo clinical sleep tracking, which involves connecting a mass of wires to different parts of your body, measuring everything from your brain waves to your heart rate to breathing abnormalities. Today, thanks to developments in technology, there are now several personal sleep trackers available on the market. Wondering whether these actually work? They will not provide you with the same level of accuracy that you would have gotten from a sleep clinic, but they are still great for learning more about the quality of your sleep. 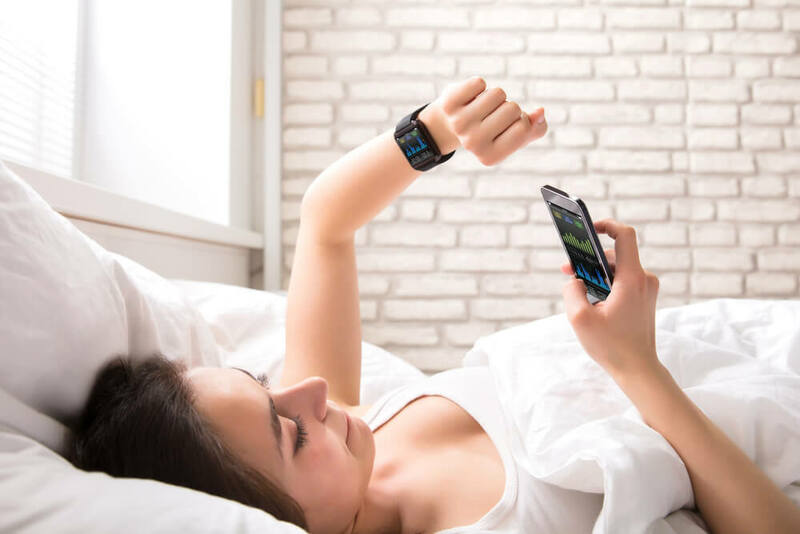 They track a variety of factors, from your bodily motions through the night to your heart rate, and give you an accurate result of how you slept at night. Now that you have worked out that your sleep quality is less than average, what can you do to improve this? Fortunately, there are several easy steps that you can take to boost your sleep quality, and therefore help improve the health of your skin. Begin by ensuring that you have a sleep-inducing bedroom. It means creating an environment that encourages sleep, such as with the use of heavy curtains or an eye mask to block out the light, as this will then tell your brain that it is time to go to sleep. The temperature of your bedroom is also important, as a temperature between 60 and 75 degrees Fahrenheit is best for a night of quality sleep. A well-ventilated room can also help, as can a comfortable mattress and pillows. Aromatherapy scents, such as lavender, can help to induce sleep, as can soft, calming music. Once you have all of this set up, it is time to turn your attention to your pre-bedtime routine. There are certain activities that are known for preventing quality sleep, and these are basically anything that may be stimulating or stressful, whether this may be work or having an emotional conversation. You should also try to avoid alcohol, nicotine and caffeine before bed, as these are all stimulants that will only keep you awake. How long before bed should you stop consuming these? About four to six hours would be ideal. To encourage your body to sleep well, try taking a shower or bath before bed, as the rise in temperature, followed by the drop, induces drowsiness. Reading a book or practicing some relaxation exercises can also really help. Find that you cannot fall asleep after lying in bed for a while? Give yourself 20 minutes. If you are still awake, get out of bed and go and do something relaxing, whether this may be listening to music or reading, just until you feel tired enough to fall asleep. The same applies if you wake up in the middle of the night and cannot fall back asleep after 20 minutes. It is also important to keep your internal body clock consistent. By going to bed and waking up at the same time each day, even on weekends. This will then encourage your body to expect sleep at a certain time, and you will find it much easier to fall asleep and enjoy some quality sleep too. As soon as you wake up each morning, open your curtains to let the natural light in, as this triggers your brain into waking up properly. There are so many different factors that can affect the quality of your sleep, but if you make this a priority, then it will not take long to improve your sleeping habits. Once you have managed to do this, you will quickly notice visible improvements, not only with your skin but also when it comes to your overall health.